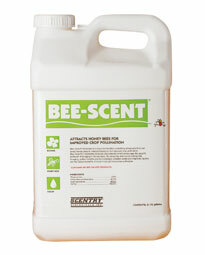 Bee-scent attractant is a liquid formulation containing attractants that can direct honey bees to treated blossoms for improved crop pollination bee-scent’s chemistry includes pheromones which encourage the specific behavior of foraging in honey bees. By attracting and concentrating bee foraging, pollen transfer can be increased. Greater yields and improved quality are the typical benefits of more thorough honey bee pollination.